21 When Jesus had again crossed over by boat to the other side of the lake, a large crowd gathered around him while he was by the lake. 22 Then one of the synagogue leaders, named Jairus, came, and when he saw Jesus, he fell at his feet. 23 He pleaded earnestly with him, “My little daughter is dying. 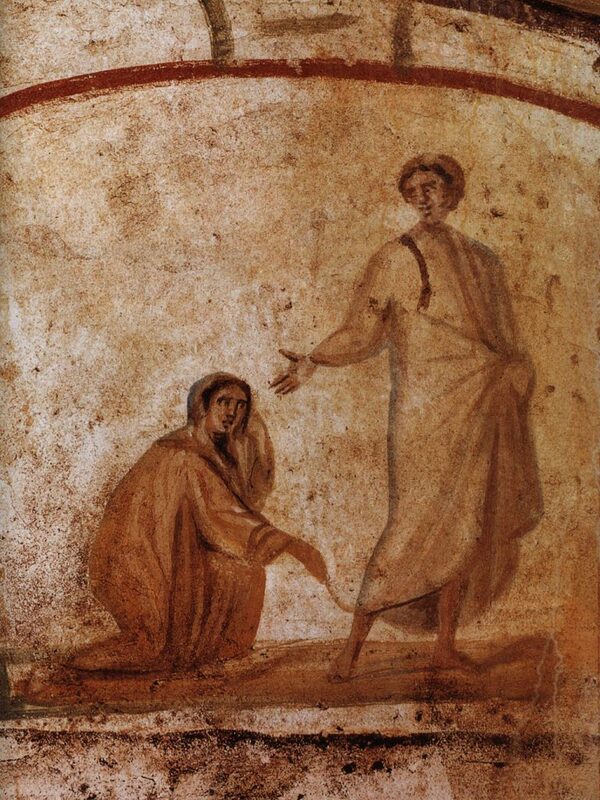 Please come and put your hands on her so that she will be healed and live.” 24 So Jesus went with him. A large crowd followed and pressed around him. .
35 While Jesus was still speaking, some people came from the house of Jairus, the synagogue leader. “Your daughter is dead,” they said. “Why bother the teacher anymore?” 36 Overhearing what they said, Jesus told him, “Don’t be afraid; just believe.” 37 He did not let anyone follow him except Peter, James and John the brother of James. 38 When they came to the home of the synagogue leader, Jesus saw a commotion, with people crying and wailing loudly. 39 He went in and said to them, “Why all this commotion and wailing? The child is not dead but asleep.” 40 But they laughed at him. After he put them all out, he took the child’s father and mother and the disciples who were with him, and went in where the child was. 41 He took her by the hand and said to her, “Talitha koum!” (which means “Little girl, I say to you, get up!”).42 Immediately the girl stood up and began to walk around (she was twelve years old). At this they were completely astonished. 43 He gave strict orders not to let anyone know about this, and told them to give her something to eat.. The salvation Jesus gives us is, not just a healing of sickness or a solving of problems, but Jesus himself. Our salvation is in God, who has an interest in each of us and loves us so much that He gave His own life for us. That is our hope that never fade away in however desperate situation we may be. We don’t have to fear anything, even death. Why did Jesus want this woman to come forward? What faith did this woman have?